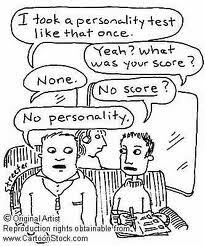 Don't personality tests crack you up? Are they ever accurate? I, particularly, would love to take that Red, Yellow, White, Blue Color Code test. Alas, I am not willing to pay. My friend, Jeff, inspired me to take the RHETI sampler. Results? Well, I scored just one point separate on these two and they were well ahead of the rest of the herd. Any accuracies at all here, in your opinions? I love personality tests. I think they're fun to take. Mostly I appreciate the way they articulate things about me that I have trouble explaining. I also like the Myers-Briggs personality test (where I am an ISFJ). ALSO! You can take the Color Code for free online, but it won't tell you anything beyond your primary color. Or, if you sign up for LDSMingle, also free, you can take the test and get very thorough explanations and complete results (then you can delete your profile). Don't ask me how I know this. Ok, you intrigued me and I took it. I'm The Helper, The Peacemaker, and "The Investigator?" I think that last one was off. My mother-in-law does the color coded test every year in her Sunday School class for fun...we have it around here somewhere...personality tests are just fun. I might have to try this personality test later tonight... I love these kinds of things! My hairstylist has a book that tells you about your personality based on the number and month of your birthday. Mine is pretty accurate! The easy-going, self-effacing type. Nines are accepting, trusting, and stable. They are usually grounded, supportive, and often creative, but can also be too willing to go along with others to keep the peace. They want everything to go smoothly and be without conflict, but they can also tend to be complacent and emotionally distant, simplifying problems and ignoring anything upsetting. They typically have problems with inertia and stubbornness. At their Best: indomitable and all- embracing, they are able to bring people together and heal conflicts.